SPZ Vertical Ultrasonic Automatic Bottle Washing Machine is used for cleaning antibiotic vials (blown or moulded) in pharmaceutical factories. And it is also used for cleaning ampoules of medicinal liquid and bottles of oral liquid. Structured like a vertical rotational drum, the machine picks up and turns over containers with a mechanical hand, with spaying nozzles following containers continuously. It cleans individual containers by ultrasonic radiation, and alternate spraying of water and compressed air. It is low in the rate of bottle breakage, universal in application and stable in operation. Its water and air pipes are contamination-free, meeting the GMP standards. The frequency of ultrasonic can be adjusted. Coarsely washing tank and the refined tank is respectively independent. Not pollute mutually. Reverse the bottle voluntarily when finely washing. Frequency conversion adjusting operating speed of whole set. easily operating. Most of materials of equipment all use stainless steel. And set up water and the air filter. 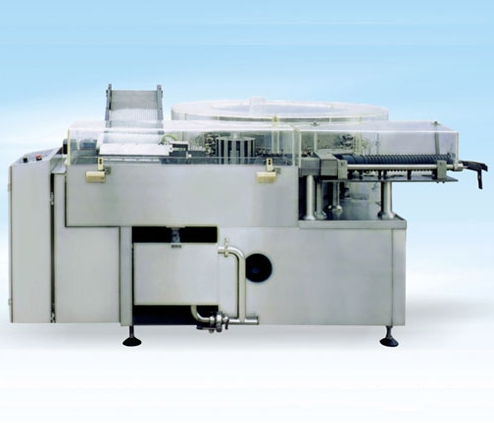 One machine can auto finish arranging bottle, coarsely washing, finely washing. Single machine can produce, also can apply to automatic production line. Looking for ideal SPZ Vertical Ultrasonic Automatic Bottle Washing Machine Manufacturer & supplier ? We have a wide selection at great prices to help you get creative. All the Automatic Bottle Washing Machine are quality guaranteed. We are China Origin Factory of Automatic Bottle Clearning Machine. If you have any question, please feel free to contact us.